CALENDRIER --- calendar in French. Just as the months and seasons change, so does Nature’s bounty. At Calendrier, we utilize the freshest seasonal ingredients to create unforgettable dishes. Our aim is for you to “feel the season on your plate”. each and every dish is generous in portion and full of our passion for excellence. Bon appétit! *A la carte dining is also available. *Prices include consumption tax. A 10% service charge is added to all checks. For details, please inquire. Your server will explain all the courses. Born in Osaka in 1965, he spent his childhood here before going to Tokyo. He honed his skills at the “Hotel de Mikuni” in Tokyo for 7 1/2 years. With years of experience under his belt, he decided to go to France to further his training. He spent a year and a half in Burgundy and Alsace before returning home and fulfilling his dream of opening his own restaurant, Calendrier, in 1997. In addition to possessing an extensive knowledge of wine, he has also fostered close relationships with our loyal customers in order to learn their culinary likes and dislikes, their favorite table and even their favorite pastime. 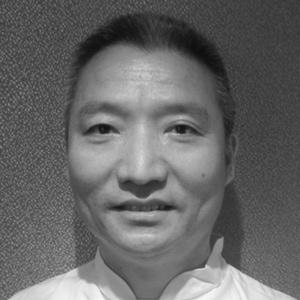 He uses his intimate knowledge of our guests to ensure professional and personalized service. * In order to ensure the enjoyment of all guests, only children junior high school age and above may dine here. * Short pants and beach sandals are not allowed.